Mary Hachmeriyan1 , Nikolai Sapundzhiev2, Miglena Georgieva1, Nataliq Dobrudjanska1, Venislav Stoyanov1, Dimitrina Konstantinova1, Lyudmila Angelova1. Background: Hereditary hemorrhagic telangiectasia (HHT or Rendu-Osler-Weber disease) is a rare syndrome, inherited as an autosomal dominant trait with incidence of 1/10000. The clinical manifestations are due to vascular malformations and predisposition to hemorrhages in different organs, the leading symptom being recurrent epistaxis. If diagnosed with HHT, the patient and his relatives and especially children have to be screened for occult vascular malformations. Case report: A 30 years old woman was treated for cerebral stroke, epistaxis, anemia, arterio-venous malformations for over 6 months. Only at this point she was diagnosed with HHT, after noticing the typical mucosal changes. Focused family history revealed symptoms of HHT in her only child, her father, aunt and two cousins The child was screened for occult vascular malformations – attainment of the nasal mucosa, lungs, gastrointestinal system, liver and brain. Pulmonary and gastrointestinal arterio-venous malformations were proven. Conclusion: Any case of recurrent epistaxis should be evaluated for HHT. After confirmation of the diagnosis every patient and close relatives have to be screened for attainment of other organs and followed up in order to prevent severe life threatening complications. Hachmeriyan M, Sapundzhiev N, Georgieva M, Dobrudjanska N, Stoyanov V, Konstantinova D, Angelova L. CLINICAL APPROACH TO HEREDITARY HEMORRHAGIC TELANGIECTASIA. J of IMAB. 2013 Jul-Dec;19(3):453-456. 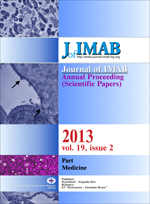 DOI: 10.5272/jimab.2013193.453. 5. Folz BJ, Lippert BM, Wollstain AC, Tennije J, Happle R, Werner JA. Mucocutaneous telangiectases of the head and neck in individuals with hereditary hemorrhagic telangiectasia – analysis of distribution and symptoms. Eur J Dermatol. 2004 Nov-Dec;14(6):407-11. [PubMed].